I felt myself on the edge of the world; peering over the rim into a fathomless chaos of eternal night. Your descent into madness has taken you far into the wilds of Arkham Horror: The Card Game! In The Forgotten Age, you took part in a scientific expedition that brought you to the dark rainforests of Central America in search of a lost Aztec city, but what you uncovered has set a series of events in motion that puts the entire world at risk. As The Forgotten Agecycle progresses, you must learn as much as you can about the dangers you unleashed to undo your mistake and save the Earth from a terrible fate. Now, your mission has brought you to a monster-filled chasm where the only way out is down. 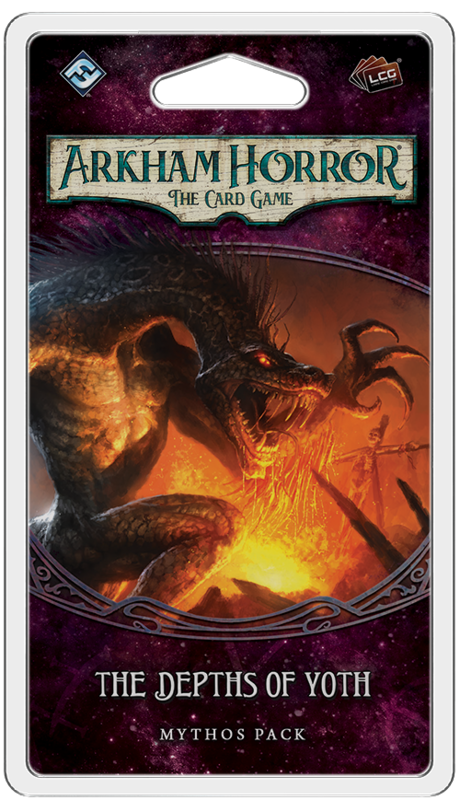 Fantasy Flight Games is proud to announce The Depths of Yoth, the fifth Mythos Pack in The Forgotten Age cycle for Arkham Horror: The Card Game—now available for pre-order at your local retailer or online through our website! 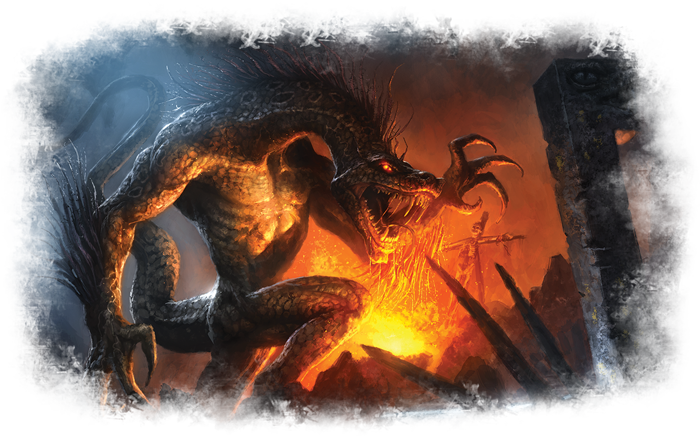 This Mythos Pack, which can be played as a standalone adventure or as part of the eight-part campaign, finds you on a perilous precipice looking into a seemingly bottomless cavern. Following the events of The City of Archives, you have reached the winding staircase that leads through the remains of another age and down into the unknown. Far below, a red glow illuminates a network of labyrinth caverns littered with the ruins of an ancient city, and from those depths there also emanates a strange, animal-like sound. Something is down there. And thus, your descent begins. 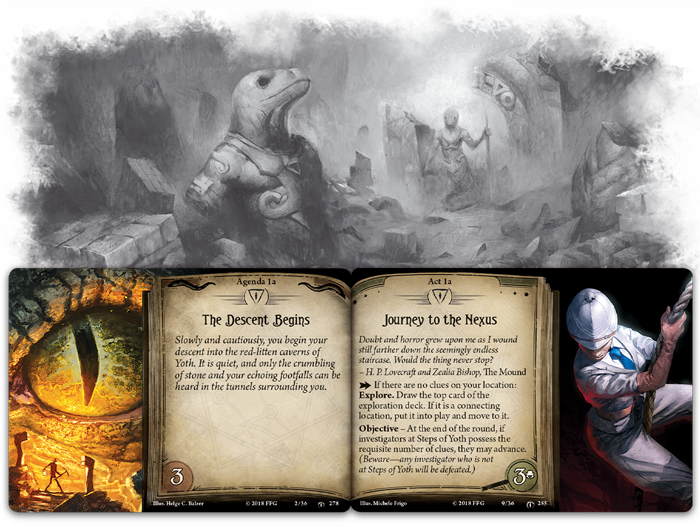 The Depths of Yoth draws you down into the deepest reaches of the Earth, tracking the current depth level of your investigation in a separate space on the scenario reference card. While the depth level has no effect on its own, deeper levels of Yoth are deadlier. Some of the creatures that dwell there, such as anEater of the Depths (The Depths of Yoth, 298), become stronger the further you descend into the cavern. 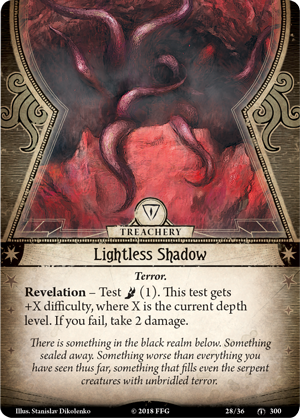 You may find that it becomes more difficult to deny your terror as you journey deeper with treacheries like Lightless Shadow (The Depths of Yoth, 300) threatening to trap you in the ruined city for all time. But the answers you seek must be waiting at the bottom of this pit, though you wonder whether they are worth facing whatever awaits. As you plunge into darkness with only the light of some unimaginable hell to guide you, you may wish to turn back—to find any other way out of this prison. But you are not alone in this cavern, and if you look back you are lost. Slithering creatures of Yoth stalk you through the twisting caverns, and even as you move deeper into the depths, they may follow by moving into the “pursuit area” beside the act and agenda decks. Enemies in this area are out-of-play, and although you can't attack them, at least they're too far away to reach you for now. Still, even if your assailants ease the chase, they are just out of view in the shadows, always watching. Waiting. 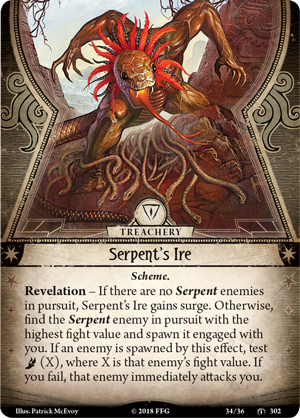 Even if your enemies may have fallen behind you as you plunge deeper into the depths, the fury of the Father of Serpents may compel them to rush forward and attack on his behalf. When his Scheme, Serpent's Ire (The Depths of Yoth, 302), is revealed, the most powerful Serpent enemy in pursuit of your team moves forward to strike, forcing you to test your agility. If you fail, that enemy immediately attacks you—and even if you dodge the first attack, you must still contend with this Serpent who's now engaged with you. To discover what awaits at the end of your journey, you must survive the descent, so be sure to stay light on your feet and pray you don't trip, lest you fall into the pit below. 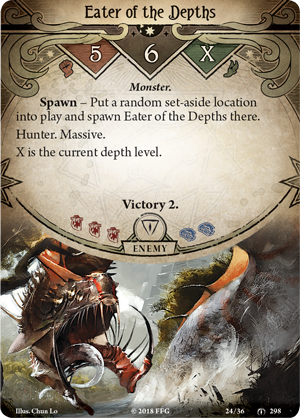 To help you dodge the monsters breathing down your neck during the descent, The Depths of Yoth provides you with new, powerful player cards to strengthen your investigators’ decks and prepare you for the trials ahead. 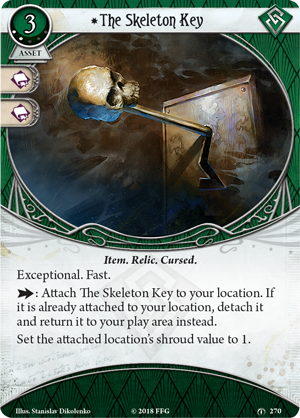 If you have The Skeleton Key (The Depths of Yoth, 270) in your possession, you may easily investigate nearly any location, unlocking the ruins’ secrets with an ease to make even Rex Murphy jealous. Meanwhile, Mystics may use the experience gained over the course of The Fogotten Age cycle to increase the potency of their arcane talents with an upgraded version of Mists of R'lyeh (The Depths of Yoth, 271). This Spell has an incredible five charges which you may use to evade, using your willpower in place of your agility. And if that weren't enough, this Spell also dramatically increases your willpower for your attempt. 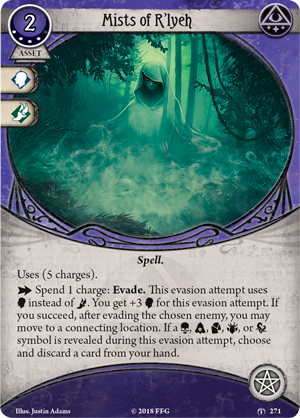 Beyond the confidence this card offers you in your own abilities, Mists of R’lyeh rewards you further if you succeed. If you pass your skill test, you may move to a connecting location—continuing your investigation without becoming bogged down by enemies. However, as often happens when you call upon the power of the Mythos, using this card comes with a certain amount of risk. If you reveal any chaos token other than a numbered token or the elder sign token, you must discard a card from your hand. Despite the inherent risk of magic, this is the time to pull out all the stops and use every tool in your arsenal. For as long as you remain trapped in this unholy pit, no one is coming to save you.